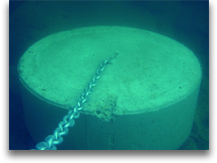 Traditional moorings generally consist of a multi-ton cement block and chain dropped onto the sea bed. As the tides shifts in and out, the chain is forced to drag the ocean floor in a 40' to 70' radius (depending on the scope). The effects are devastating to any sea life within the drag circle, leaving a dead zone footprint where the eel grass would normally flourish. Sea grass ecosystems are among the most diverse and productive ecosystems in the world. In ecological and economic value, they rival tropical rainforests and the world's richest farmlands. Eelgrass creates a highly structured habitat from loose and shifting sands. Healthy eelgrass beds form dense underwater meadows that provide habitat for invertebrates, substrate for diatom and algae growth, and food and cover for a myriad of species. Eelgrass beds are recognized as "nursery" areas for many marine and anadromous species. 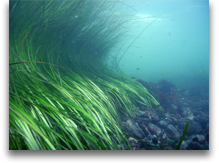 Eelgrass provides food, shelter and protection from predators for many juvenile fish and shellfish of ecological, commercial and recreational importance. Sea grass beds play an important role in the life cycles of shellfish, crabs, finfish, and waterfowl. Of particular interest to current efforts to restore native salmonid populations, eelgrass has been designated as "Essential Fish Habitat" for juvenile salmonids. Juveniles utilize eelgrass beds for cover and forage as they move from freshwater to the ocean. In addition, Pacific herring and other coastal fish specifically spawn in eelgrass. 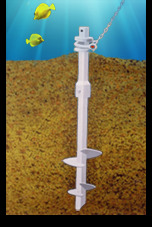 The Helix anchor system with sub surface float never touches the ocean floor, creating a very environmentally friendly mooring.